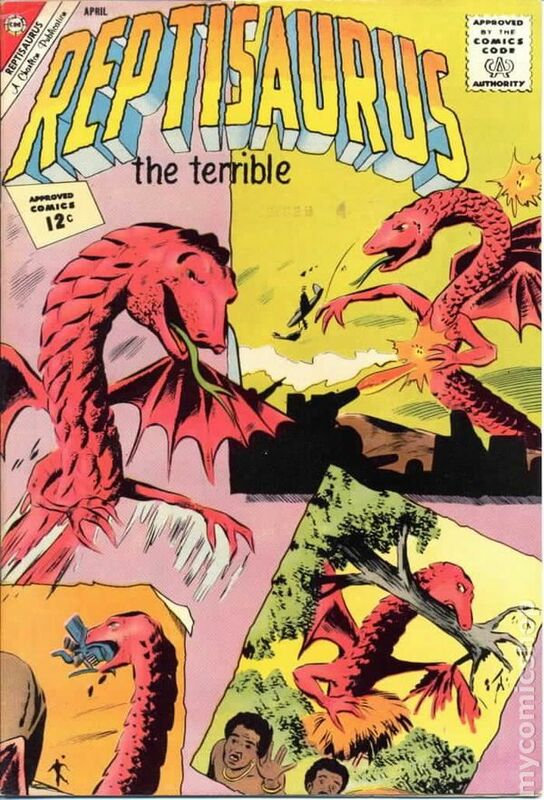 Reptilicus is a winged serpent kaiju that first appeared in the 1961 kaiju film, Reptilicus. Reptilicus is a snake-like creature with wings and legs, which make him resemble a cross between a wyvern and a Chinese dragon. He has light grey skin and prominent fangs. Most of his body is covered by large scales which provide protection from tank and artillery fire. A group of miners dug up Reptilicus' tail when they were drilling in Lapland. It was flown to the Danish aquarium in Copenhagen, where it was put in a cold room for study. Due to careless mishandling, the door was left open and the section began to thaw, only for scientists to find that it was beginning to regenerate. The creature was dubbed "Reptilicus" and its regenerating ability was compared to other animals like earthworms and starfish. Once fully regenerated, it went on a rampage across the Danish countryside, to raiding the neighboring cities of Hamburg and Stockholm, before landing in the panic-stricken streets of Copenhagen. It was presumably killed when poisoned by ingenious scientists and military officers, but its foot sank to the bottom of the sea, leaving the possibility that the foot could regenerate. In the American version of his film, Reptilicus can spit neon green acid. Since the decision to add this effect was made in post-production, the acid does not interact with any object or person, making its potency impossible to determine. In the Danish version of his film, Reptilicus is capable of low-altitude flight. This ability is also demonstrated in Charlton's comic book series. Reptilicus is able to secrete an oily substance from its body that minimizes the effects of damage from fire. This ability is only mentioned in the film's screenplay and the Danish version, and not directly shown. Reptilicus possesses incredible regeneration, similar to that of earthworms and starfish, being able to regenerate from a single body part in only a few hours. General Mark Grayson, using an M2 flamethrower, was able to easily set Reptilicus ablaze. Had the monster not immediately retreated to the sea, it would likely have perished. Reptilicus was portrayed by a wired marionette. The film Reptilicus was the first film to be featured in the 2017 revival of Mystery Science Theater 3000. Mystery Science Theater 3000: The Return also featured an original villain, a giant robotic serpent or worm creature, named Reptilicus Metallicus, in honor of the premiere episode's movie. In the 2012 horror movie Cabin in the Woods, there is a humanoid reptile-like creature named Reptilicus, aside from its name, its design also seems to be inspired by The Creature from the Black Lagoon, the Alien franchise, Jurassic Park, & the 1978 Sci-Fi/Horror movie Slithis. I also think the Acid Spit was only for the westerners. I never saw him use it in the original film. This is the first page i created on this wiki, and Reptilicus needs some love! This page was last edited on 9 January 2019, at 03:35.